The eponymous Meat Fruit – the star attraction at ‘Dinner by Heston,’ recently anointed within the world’s top ten restaurants. A dish said to be so complicated that it can only be completed with 6 days hard work and plenty of gastro-gadgets. In actual fact this dish can be completed within 2 days and is technically quite straight forward. It is essentially a super-smooth chicken liver parfait. The only things you may need to go and buy are a blowtorch and some semi-circular moulds. The recipe below is more or less the one I used while working at Chez Bruce in London. Although the refinement used at ‘Dinner’ creates a slightly smoother result than the Chez Bruce parfait, the below recipe is a really nice michelin standard dish that is achievable at home. I have tried to substitute ingredients that are not readily available for those that are. For example glucose is substituted for sugar. Although glucose is less sweet and liable to produce a smoother texture* for the outside jelly, I have tried the recipe with both and there is no discernible difference. I have ignored the advised 24 hour marination at the beginning of the recipe (we never did this for the Chez Bruce parfaits) and certainly forgot about the mandarin oil and paprika extract! I would say it is important not to substitute anything for the parfait reduction as the port and madeira create a much more interesting flavour than simply using red wine. 400g chicken livers – trimmed weight (remove the white stringy stuff in the middle). Reduce the madeira, port, brandy with the shallots and garlic until almost completely dry (remember to stir towards the end so that the mixture does not burn on the bottom). Place the reductionand warm livers in a blender(a powerful handblender is just as good). While blending add the eggs then butter until combined (do not overmix). Put the mix through a fine sieve then pour into a terrine mould (roughly 25cm long). Place in a bain marie, add tin foil (see picture) then put in the oven. Remove when the internal temperature reaches 64 degrees (around 1 hour). Let set in the fridge overnight. In the morning remove the terrine mould from the fridge and carefully scrape off the grey oxidised top. This will leave you with the nice pink parfait underneath. Working quickly (so that the parfait does not oxidise) spoon the parfait into the semi-circular moulds. Save a little of the parfait for later. Make sure to push down firmly so that you are left with no air pockets. Smooth over the top with a knife so that you have nice even semi circles. Place a layer of cling film over top (again to prevent oxidisation) and place in the freezer to set (around 5 hours). In the afternoon remove 2 semi circles and gently blowtorch the surface and press together to form a sphere. Use the reserved parfait to smooth any cracks. Stick a toothpick into the centre of the sphere and place back in the fridge for another hour. Repeat with the remaining semi circles. Meanwhile reduce the orange juice to 250g. At the time soak the gelatine in cold water. 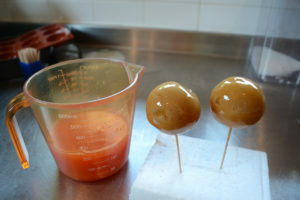 Remove the reduction from the heat and mix in the soft gelatine. Let cool to room temperature mixing every now and again to make sure that the mix remains completely homogenous. Remove the parfaits from the freezer and dunk them into the reduction. Place in fridge on the polystyrene base (see picture) and briefly leave until set (no more than 1 minute). Repeat this process 3 times or until you can no longer see the parfait through the jelly. Remove the tooth pick from the parfait and place in the fridge until completely defrosted (about 2 hours). Just before serving gently push your thumb into the top of the parfait to achieve a nice fruity shape. Add a leaf to the top (at The Tasty Ski Company we pinch a couple of proper mandarin leaves from the local Carrefour) and serve with grilled bread. *Glucose is excellent at preventing crystallisation largely because it is a simple sugar. When sugar sets it is liable to form large crystals and create a course and grainy texture. *The theory here is that when you create an emulsion with the eggs, butter, livers and reduction they are most easily combined when at the same temperature. It is better to do this at 50 degrees rather than at room temperature as when you put the mix in the oven it comes up to setting temperature more quickly and uniformly. It can not be done at too high a temperature or the eggs will prematurely coagulate – this will happen between 70 – 77 degrees. Fun to discover your blog — great style! Hi Helene, thanks very much. I desperate to get my hands on a Thermomix as soon as I can afford one! !